To setup custom signatures to be included within marketing materials. This is essential for branding purposes and representing yourself so that the homeowner knows who you are and knows of how to connect with you. Click on your name in the top right corner. A menu will populate. Within the 'Profile' module to the left, click on 'Signatures'. The first module is 'Email Signature Option 1: HTML'. The second part of the first module consists of 'Email Signature Option 2: Image' as well. This is where you can create a custom email signature from scratch or using HTML code. 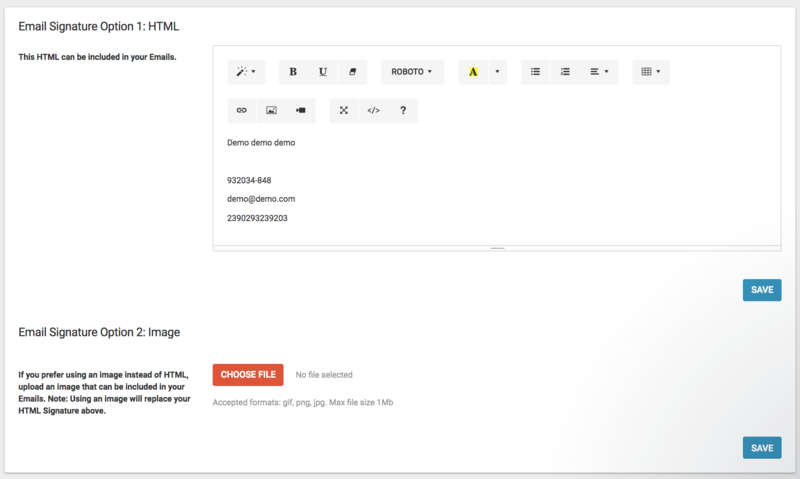 If you prefer using an image instead of HTML, upload an image that can be included in your emails. Remember that using an image will replace your HTML signature in option 1. Accepted formats for image include gif, png, jpg. and maximum file size is 1Mb. To select an image from your computer to add as an email signature click on the 'Chose File' button and after you have made your selection click on 'Save'. You are able to select a file to include in your digital letters. Click on 'Chose File' within the 'Letter Signature' module. After making your selection make sure to click on 'Save'. Content added to the 'Text Signature' will be included at the end of Text Messages. Keep the content very short. Text Messages are 140 characters. We recommend including your name. Click on the bar in the middle of the module. You will be able to add content from here. Make sure to click the 'Save' button. After adding your content make sure to click 'Save'. Search Terms: Signature. signatures, disclaimer, text, letter, email, chose, file.